Being in my 20's and obviously most of my friends are too means a lot of new homeowners, renters, & fixer up buyers! And I am often asked about various things to do in your home that don't necessarily mean breaking the bank or breaking ground on a renovation. Being a first time homeowner myself I also understand the overwhelming to-do list that hits you one you have moved. 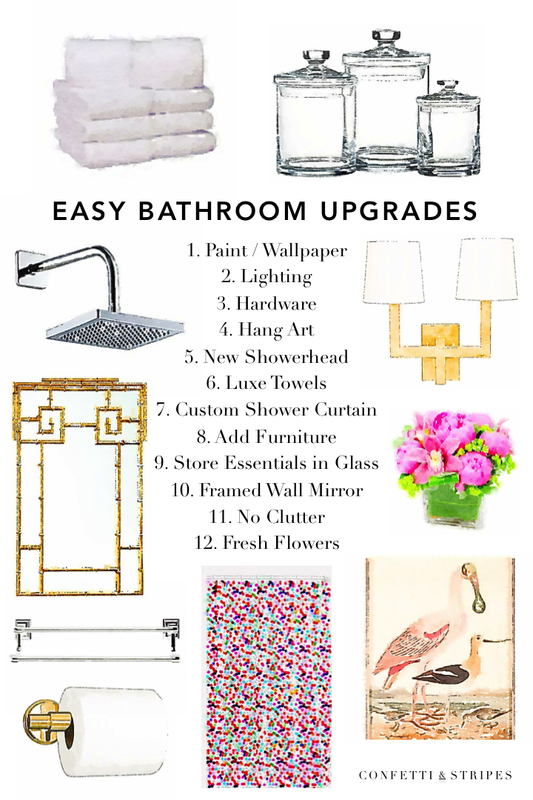 I've put together some easy upgrades for your bathroom to hopefully help. These are perfect for making your builder grade bath a little more personal. For the bathroom you plan to renovate down the road, yet can't deal with its current state! And even for renters who still want to make their residence more of a home! Your bathroom is usually where you start and end your day so it should be a space you love! 1. Paint / Wallpaper. Probably the easiest and most dramatic change you can make. Also don't forget to look past your vanity. So many times people are scared to paint this...even if you have the laminate type from Home Depot painting the base can make your bathroom feel so much more luxe. Just make sure you use a paint that works with your surface! 4. Hang Art. Don't be scared to hang a fabulous piece of art in the bathroom. "Warnicke Spoonbill"
8. Add Furniture. If you have the space add a small chest or even a garden stool. Extra storage..bam! 11. No Clutter. The free one on the list! Nothing ruins a bathrooms ambiance like tons of random bottles and toothpaste tubes laying around. Clear out chaos! 12. Fresh Flowers. They make any space better. Have something pretty to wake up to in the morning...they are proven to make you happier! These are such great tips! It's amazing what a few adjustments can make!